Brandon Adams of Framingham, 16, a junior at Norfolk County Agricultural High School, said he stopped playing sports out of fear for his well-being. As Framingham public school athletes return to the field this month, they’ll be covered by a formal inclusion policy that expressly respects the gender identity and sexual orientation of all students. Framingham’s athletic policy appears to be the first to codify what is longstanding practice in many Massachusetts schools, and mirrors guidance from the state’s Department of Elementary and Secondary Education, school officials said. The policy, approved by the School Commiteee this past spring, states that teachers, volunteers, and others in the school community “must be respectful of the ways in which individual people ask to be identified” and use a student’s choice of personal pronouns. Students will have the right to participate on teams and use locker room facilities consistent with their gender identity. They can also use a private changing area. No student will be forced to wear a uniform that is inconsistent with his or her gender identity. Hailey VanAelstyn, 16, of Framingham, unloads her ice hockey league gear. For Framingham students who are part of the LGBTQ community, the policy means their schools are embracing them as they are, said 16-year-old Hailey VanAelstyn. VanAelstyn plays for Framingham High’s varsity girls’ ice hockey team and junior varsity girls’ soccer team. She also suits up for ice time with the Blackstone Valley Barons, a regional summer hockey team. VanAelstyn said her teammates have given her lots of support, but she said that is not the case for every student athlete in the LGBTQ community. Nearly 16 percent of Massachusetts residents ages 18 to 24 consider themselves lesbian, gay, bisexual, or transgender, according to a report this spring. This group often faces a greater risk of experiencing discrimination, depression, and being homeless. 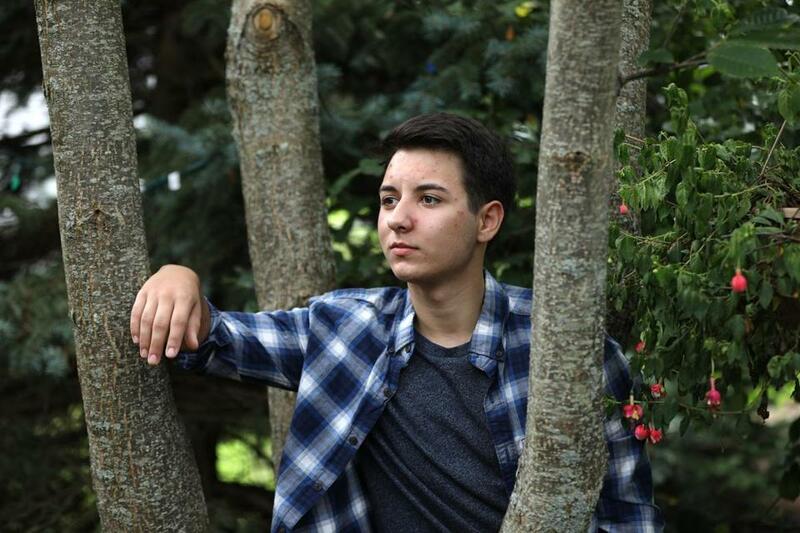 Brandon Adams, 16, a Framingham resident who helped develop the school athletics policy, said there is much work to be done in advocating for LGBTQ youth in schools and in sports. Adams is a transgender male, and said he stopped playing sports out of fear for his well-being. “I still am scared, but I believe this [policy] gives any LGBTQ athlete, including myself, a sense of acceptance and safety,” Adams said in an e-mail. Adams is a junior at Norfolk County Agricultural High School, and was a public advocate for the state’s equal accommodations law. Framingham’s policy, he said, also is a step in the right direction. With Framingham’s new athletic policy in place, other school districts are likely to follow suit, said Mark Sullivan, the principal at Burlington High School. Burlington’s practice has been to follow state guidance, such as respecting students’ gender identities and use of personal pronouns, and the high school offers gender-neutral changing areas and bathrooms, Sullivan said. There are also school organizations intended to foster equity and tolerance among students. “We try to be a safe space for all kids,” Sullivan said. In Newton, the practice has been to encourage inclusion of students in educational and athletic programs, said Tom Giusti, athletics director at Newton North High School. The district provides locker room and other dedicated spaces for transgender students. “As educators, we should be doing the right thing by kids,” Giusti said. The issue of respecting students’ gender identity is front and center for school athletics officials across the state, said Marilyn Slattery, president of the Massachusetts Interscholastic Athletic Association’s board of directors and a house principal at Malden High School. VanAelstyn hopes the policy will help change the minds of those opposed to respecting LGBTQ rights, and make it clear that “We’re here, and deserve the exact same as you do,” she said.